When someone sends a message, something rather fascinating and mysterious gets passed along. Let’ say Alphonse in Alsace wants to send the message, ‘Ned, the war is over. Al’. He dictates it to a friend; the message has begun as patterns of air compression (spoken words). His friend puts it down as ink on paper and mails it to another, who puts it in a fax machine. The machine transfers the message into a coded pattern of electrical impulses, which are sent down a phone line and received at a remote Indian outpost where it is printed out in letters once again. Here the person who reads the fax lights a campfire and sends the same message as a pattern of smoke signals. Old Ned in Nevada, miles away, looks up and gets the exact message that was meant for him. Nothing physical has been transmitted; not a single atom or molecule of any substance travelled from Alsace to Nevada, yet it is obvious that something travelled all the way. This elusive something is called information. It is obviously not a material thing, since no matter has been transmitted. Yet it seems to need matter on which to ‘ride’ during its journey. This is true whether the message is in Turkish, Tamil or Tagalog. The matter on which information travels can change, without the information having to change. Air molecules being compressed in sound waves; ink and paper; electrons travelling down phone wires, semaphore signals—whatever—all involve material mediums used to transmit information, but the medium is not the information. This fascinating thing called information is the key to understanding what makes life different from dead matter. It is the Achilles’ heel of all materialist explanations of life, which say that life is nothing more than matter obeying the laws of physics and chemistry. Life is more than just physics and chemistry; living things carry vast amounts of information. Some might argue that a sheet of paper carrying a written message is nothing more than ink and paper obeying the laws of physics and chemistry. But ink and paper unaided do not write messages—minds do. The alphabetical letters in a Scrabble® kit do not constitute information until someone puts them into a special sequence—mind is needed to get information. You can program a machine to arrange Scrabble® letters into a message, but a mind had to write the program for the machine. Some people think that DNA is alive—this is wrong. DNA is a dead molecule. It can’t copy itself—you need the machinery of a living cell to make copies of a DNA molecule. It may seem as if DNA is the information in your body. Not so—the DNA is simply the carrier of the message, the ‘medium’ on which the message is written. In the same way, Scrabble® letters are not information until the message is ‘imposed’ on them from the ‘outside’. Think of DNA as a chain of such alphabet letters linked together, with a large variety of different ways in which this can happen. Unless they are joined in the right sequence, no usable message will result, even though it is still DNA. Now to read the message, you need a pre-existing language code or convention, as well as machinery to translate it. All of that machinery exists in the cell. Like man-made machinery, it does not arise by itself from the properties of the raw materials. If you just throw the basic raw ingredients for a living cell together, without information nothing will happen. Machines and programs do not come from the laws of physics and chemistry by themselves. Why? Because they reflect information, and information has never been observed to come about by unaided, raw matter plus time and chance. Information is the very opposite of chance—if you want to arrange letters into a sequence to spell a message, a particular order has to be imposed on the matter. When living things reproduce, they transmit information from one generation to the next. This information, travelling on the DNA from mother and from father, is the ‘instruction manual’ which enables the machinery in a fertilized egg cell to construct, from raw materials, the new living organism—a fantastic feat. This is in a new combination so that children are not exactly like their parents, although the information itself, which is expressed in the make-up of those children, was there all along in both parents. That is, the deck was reshuffled, but no new cards were added. How much information is contained in the DNA code which describes you? Estimates vary widely. Using simple analogies, based upon the storage space in DNA, they range from 500 large library books of small-type information, to more than 100 complete 30 volume encyclopaedia sets. When you think about it, even that is probably not enough to specify the intricate construction of even the human brain, with its trillions of precise connections. There are probably higher-level information storage and multiplication systems in the body that we have not even dreamed of yet—there are many more marvellous mysteries waiting to be discovered about the Creator’ handiwork. Not only is the way in which DNA is encoded highly efficient—even more space is saved by the way in which it is tightly coiled up. According to genetics expert Professor Jérôme Lejeune, all the information required to specify the exact make-up of every unique human being on Earth could be stored in a volume of DNA no bigger than a couple of aspirin tablets!2 If you took the DNA from one single cell in your body (an amount of matter so small you would need a microscope to see it) and unravelled it, it would stretch to two metres! This becomes truly sensational when you consider that there are 75 to 100 trillion cells in the body. Taking the lower figure, it means that if we stretched out all of the DNA in one human body3 and joined it end to end, it would stretch to a distance of 150 billion kilometres (around 94 billion miles). How long is this? It would stretch right around the Earth’ equator three-and-a-half million times! It is a thousand times as far as from the Earth to the sun. If you were to shine a torch along that distance, it would take the light, travelling at 300,000 kilometres (186,000 miles) every second, five-and-a-half days to get there. 1. The coded information used in the construction of living things is transferred from pre-existing messages (programs), which are themselves transmitted from pre-existing messages. 2. During this transfer, the fate of the information follows the dictates of message/information theory and common sense. That is, it either stays the same, or decreases (mutational loss, genetic drift, species extinction) but seldom, probably never, is it seen to increase in any informationally meaningful sense. 3. Were we to look back in time along the line of any living population, e.g. humans (the information in their genetic programs) we would see an overall pattern of gradual increase the further back we go. 5. There had to be a point in time in which the first program arose without a pre-existing program—i.e. the first of that type had no parents. 6. Information and messages only ever originate in mind or in pre-existing messages. Never, ever are they seen to arise from spontaneous, unguided natural law and natural processes. The programs in those first representatives of each type of organism must have originated not in natural law, but in mind. This is totally consistent with Genesis, which teaches us that the programs for each of the original ‘kind’ populations, with all of their vast variation potential, arose from the mind of God at a point in time, by special, supernatural creation. These messages, written in intricate coded language, could not have written themselves, as far as real, observational science can tell us. Once the first messages were written, they also contained instructions to make machinery with which to transmit those messages ‘on down the line’. DNA, this marvellous ‘message molecule’, carries that special, non-material something called information, down through many generations, from its origin in the mind of God. Similarly, in our example at the beginning, Ned could read the message which originated in the mind of Al without ever seeing him. ‘For the wrath of God is revealed from heaven against all ungodliness and unrighteousness of men, who hold the truth in unrighteousness; Because that which may be known of God is manifest in them; for God hath shewed it unto them. For the invisible things of him from the creation of the world are clearly seen, being understood by the things that are made, even his eternal power and Godhead; so that they are without excuse’. These verses seem even more appropriate in our day, when we have been privileged to be able to decipher some of the biological language written on DNA by the living Word, Jesus Christ the Logos Creator, during those six days of creation. The most wonderful message from the Logos, though, is surely John 3:16, ‘For God so loved the world, that he gave his only begotten Son, that whosoever believeth in him should not perish, but have everlasting life’. 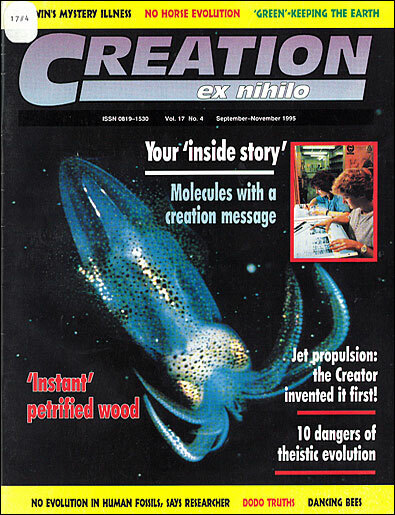 New Scientist, November 26, 1994, p. 17. Return to text. Jérôme Lejeune, Anthropotes (Revista di studi sulfa persona e la famiglia), Istituto Giovanni Paolo 11, Rome, 1989, pp. 269-270. Return to text. Remember that each cell contains the total information—i.e. there are multiple copies of the same blueprint, one in each cell. The two-metre distance is enough to specify you. Return to text. *Actually, it is as if there were two ‘strings of beads’ running in parallel—the information on one is from your mother, on the other from your father. Now think of these two parallel strings cut into 23 pieces—these are your chromosomes. The beads are like alphabet letters, and the particular order of the beads is what gives the information. Individual stretches (or ‘sentences’) of information are called genes. Theoretically, each cell contains all the information that specifies you.